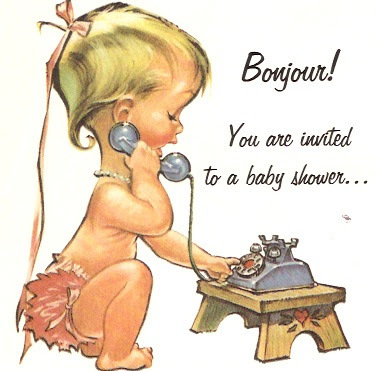 Rosy Gold Bebe: A Beautiful Bebe Shower!! My sister, mother, and aunt just threw me the most beautiful bebe shower!!!! It was a parisian countryside theme. It was absolutely beautiful and everything was delicious!!!! The house was decked with beautiful flowers, eiffel towers, country-chic diaper cakes, and clothes lines adorned with my old baby clothes, which are in amazing condition & I can not wait to put my own little girl in!!! It was pure joy to have the house filled with family & friends we love so dearly. We were showered with wonderful gifts & books. Guests were given chic little travel manicure kits and a full size Essie or OPI nail polish as favors. The large spread of food & desert was delicious accompanied by various wine, a sparkling raspberry punch, lemon water, or iced tea. Upon my arrival I was so touched by the all the hard work & effort that was put into making this shower so beautiful. I hope our guests had an amazing time, we certainly did!! Thank you again to everyone for coming, gifting, & simply spending time with us before the arrival of our lil Penelope Peanut!! Thank you again to my sister, mother, and aunt for all your hard work & beautiful craftiness!!!! LOVE ALL OF YOU SO MUCH!!! !